Flat beauty. The VivoBook U38DT is a 13-inch subnotebook that is powered by a Trinity processor and the brand new Radeon HD 8550M from AMD. The ultra-thin construction and the precious metal ensure a very nice look. Is it worth the 800 Euros (~$1092)? The VivoBook U38DT-R3001H is for mobile users who need a compact, lightweight and portable device. Under the hood of the aluminum chassis is primarily AMD hardware. 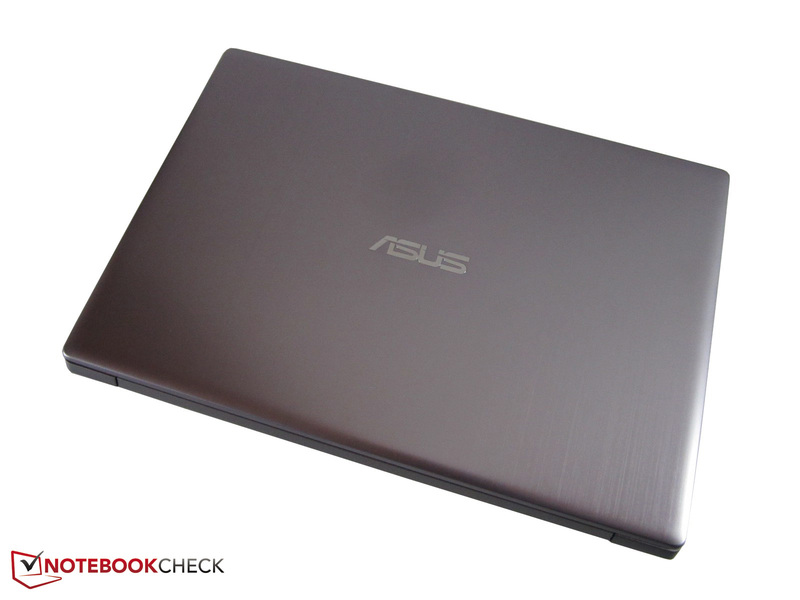 Let us start with a few specs before we get to the details: Asus has decided to use the A8-4555M CPU. The inexpensive ULV model is primarily focused on newcomer and modest users with a clock of 1.6 up to 2.4 GHz. 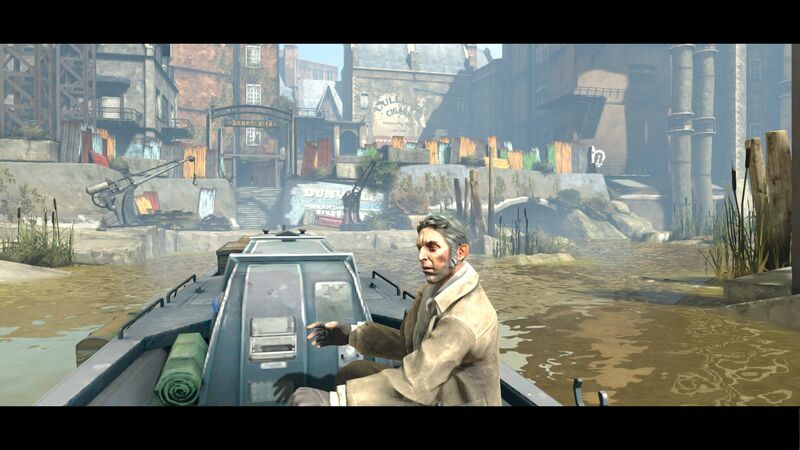 The dedicated graphics card performs better. 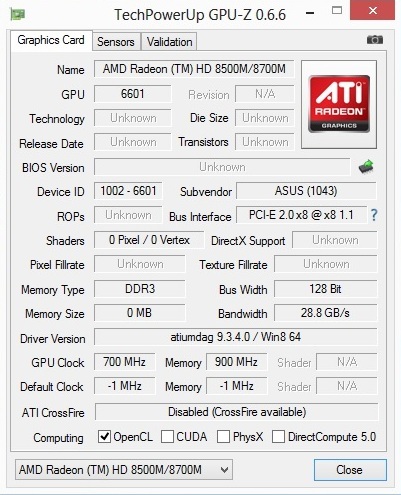 Depending on the application the performance of the Radeon HD 8550M is in the low or mainstream area. The memory equipment is midrange with 4 GB DDR3 RAM (1600 MHz). While 2 GB are in a common slot, the remaining two GB are soldered onto the mainboard. 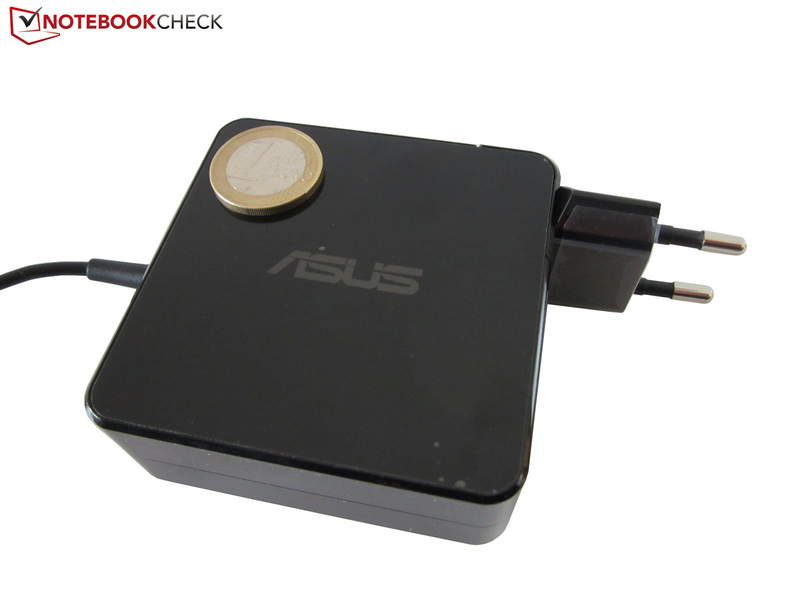 To avoid storage problems Asus integrates a 500 GB hard drive with 5,400 rpm. 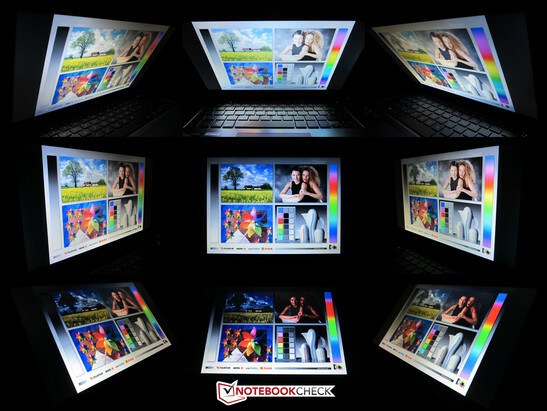 The anti-glare display with a resolution of 1366x768 is suitable for the notebook class. The operating system is Windows 8 64-bit. 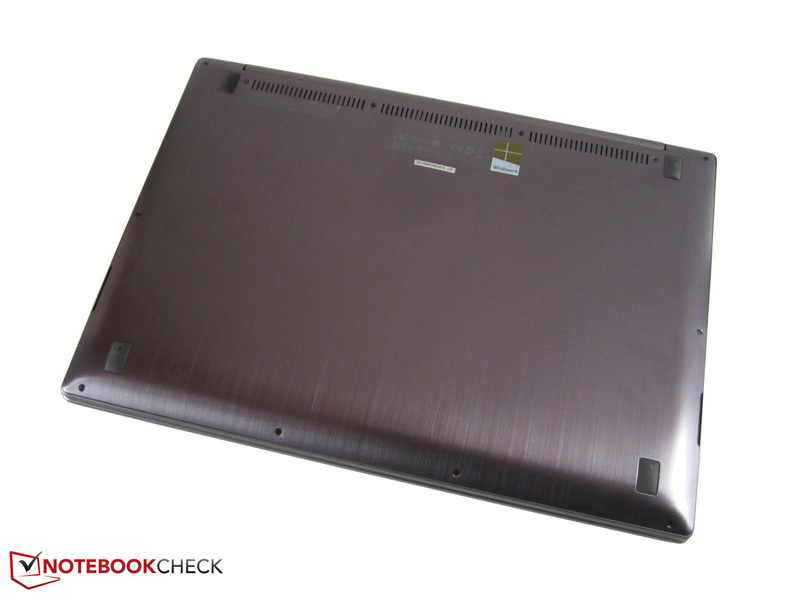 The excellent case is one of the great strengths of the VivoBook U38DT. 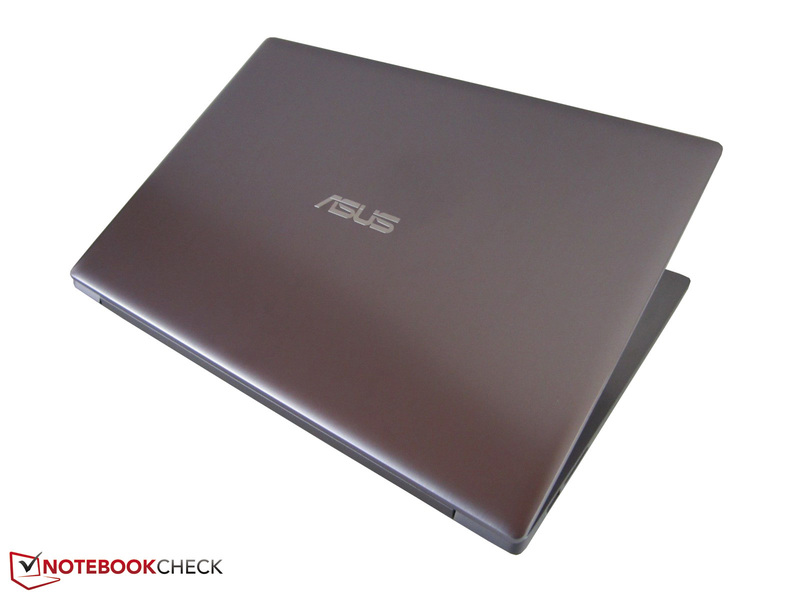 Asus almost exclusively uses brushed aluminum that gives the 13-inch device a great quality impression. The silver-gray colored surfaces are exceptionally sophisticated. Except for the manufacturer labels (cover & display frame) the 13-inch device is matte finished throughout. Very few notebooks are that dirt resistant. Compared to other devices the surfaces are pretty durable. The praise continues with the good stability: Despite the thin case the surfaces hardly dent even under high pressure. 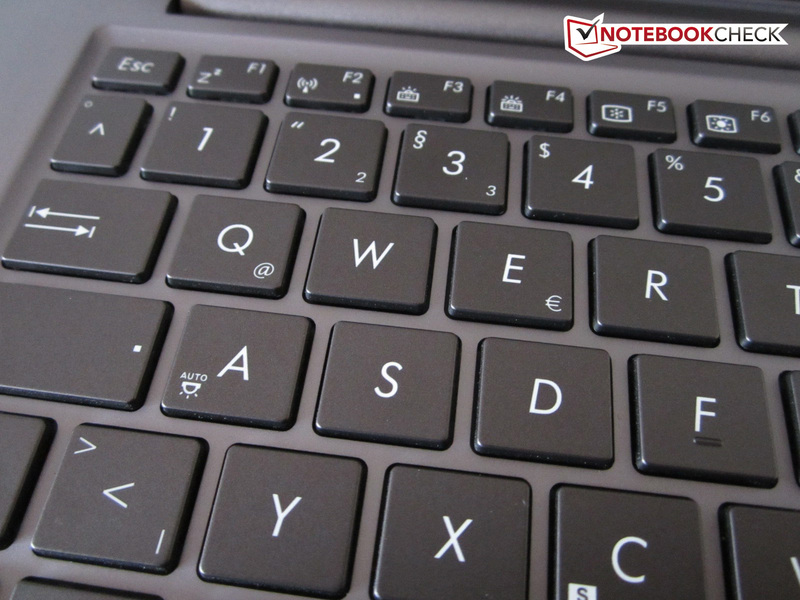 Smaller weaknesses can be found with the touchpad and in the center of the keyboard. The subnotebook also offers a great performance when it comes to the looks. University, office or desk at home: The 13-inch device looks good in every environment. Because of the low height (just under two centimeters [~0.79 inches] at the thickest point) and the lightweight construction (1.55 kg/~3.42 pounds) the mobility of the device is very good. Standard notebooks appear enormous and bulky next to the U38DT. Even the light (236 grams/~0.52 pounds) 65 Watt power supply unit is directly connected to the socket and at 75 x 75 x 28 millimeters (~2.95 x 2.95 x 1.10 inches) also surprisingly small. If you are often on the road you do not want to be without it. Thanks to the small dimensions the subnotebooks becomes the ideal companion. In the category of build quality the manufacturer does not disappoint as well. The material transitions of our review sample were very clean. The hinges are also well designed. The base unit does not swing: the device can be opened with one hand. Great: Vibrations have almost no impact on the cover. The connectivity is not so convincing. An especially positive aspect is the sophisticated port layout. 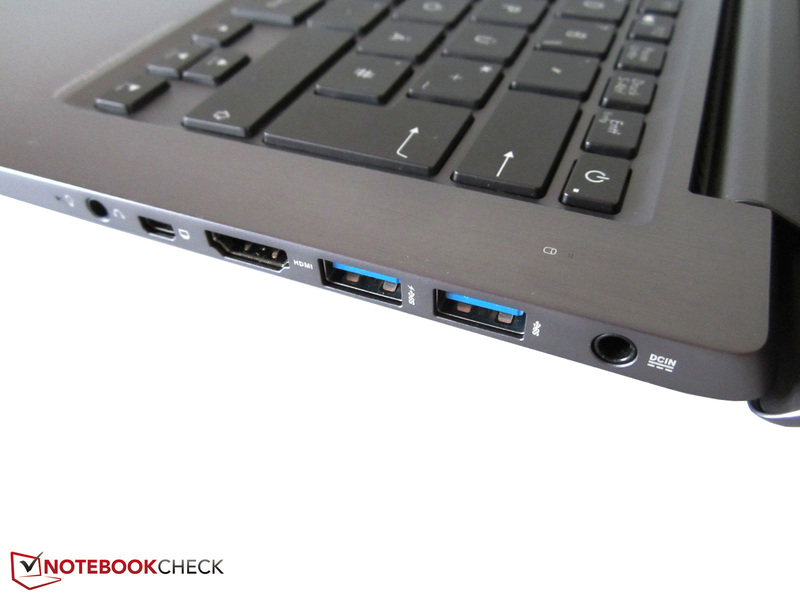 To avoid unpleasant collisions with an external mouse all the ports are located at the rear half of the notebook. While the left side has one USB 3.0 port and a 3-in-1 card reader (SD, SDHC, MMC), the right side has the power connector, two more USB 3.0 ports, one HDMI output and one Mini VGA port. Wait a minute, Mini VGA? Correct, considering the thin base unit Asus gives up the Ethernet port and a full VGA port. At least two adapters come with the notebook, which offer an optional analog video output (VGA to Mini VGA) and a Gigabit-Ethernet port (RJ-45 to USB 2.0) for the U38DT. The left side also has a combined audio jack (input + output). 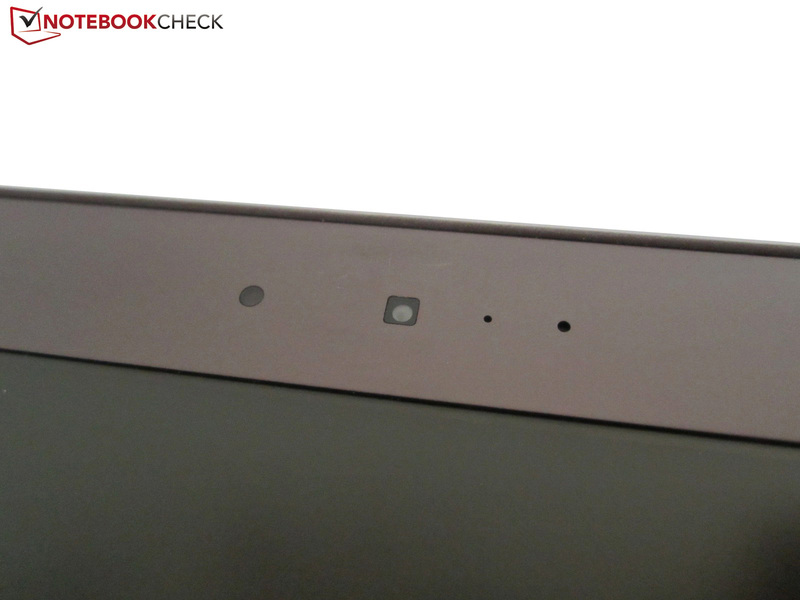 Furthermore the 13-inch device has an integrated microphone and an HD webcam with 720p. eSATA, FireWire and a DisplayPort are missing as well as an optical drive..
Next to Bluetooth 4.0 the VivoBook U38DT supports all common WLAN standards (802.11 b/g/n). The integrated Broadcom module did not perform very well in the review. Many competitors have a better range. A special tool is required to access the inside of the subnotebook. The reason is that the bottom cover is made of a single metal plate and attached to the case with 12 Torx screws. The absence of a typical maintenance cover, which allows fast access to the memory and hard drive, might have a negative impact for some users. To avoid damage to the shop unit we did not remove the bottom cover as an exception. The amount of preinstalled software is small: 25 applications are an indication of a reasonably cleaned up hard drive. 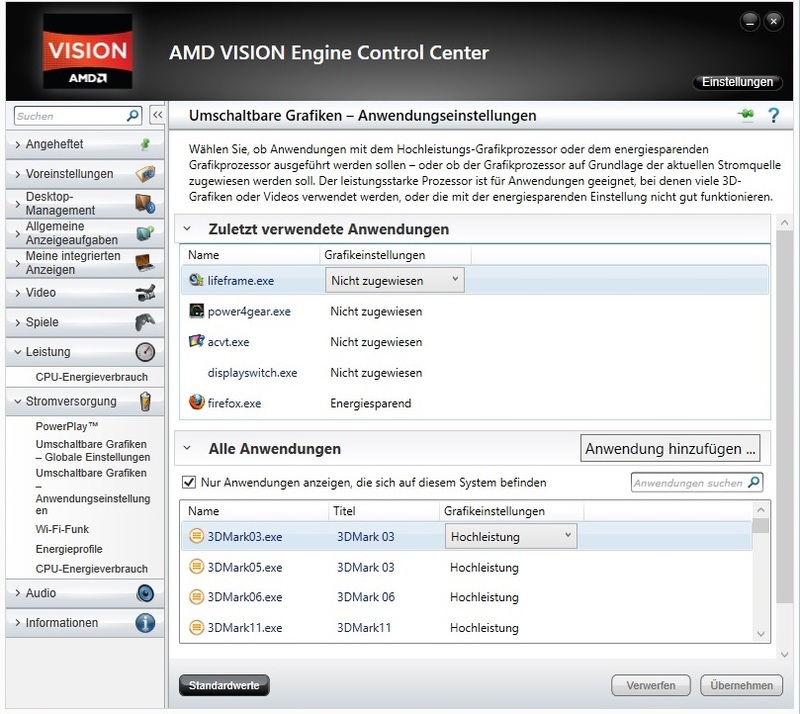 In the windows control panel (right picture) the buyer discovers primarily drivers and manufacturer tools. 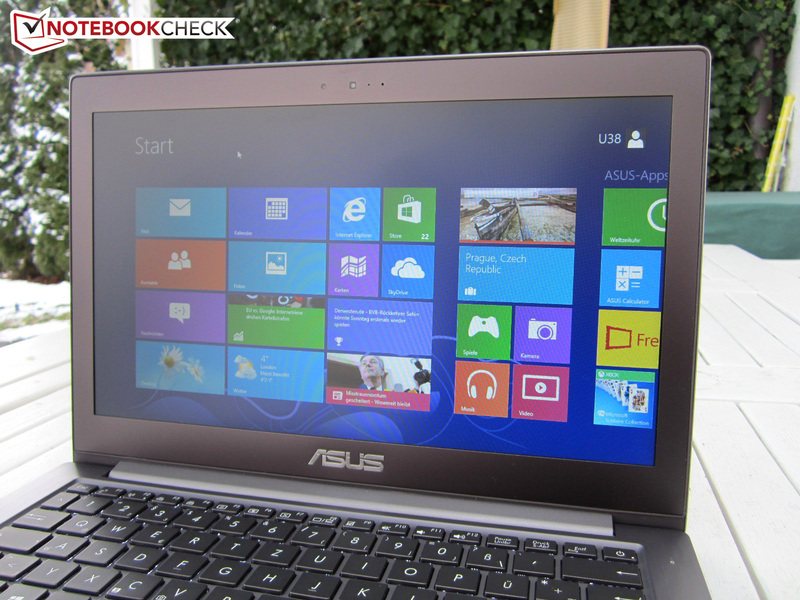 Numerous elements are already known from other Asus notebooks. 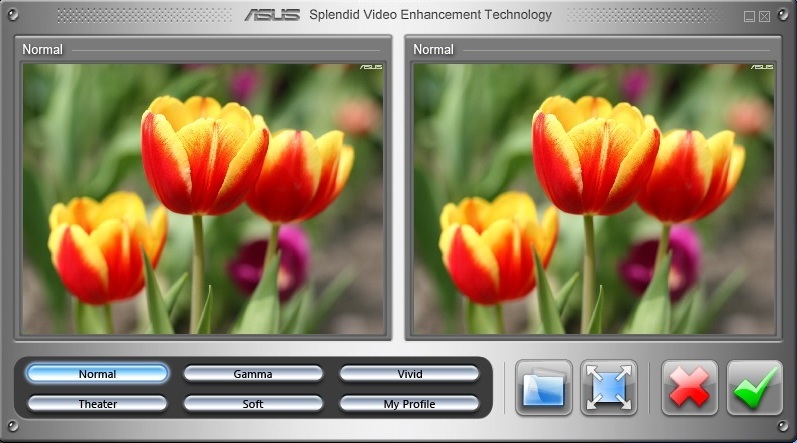 The “Splendid technology”, for example, tunes the color reproduction. 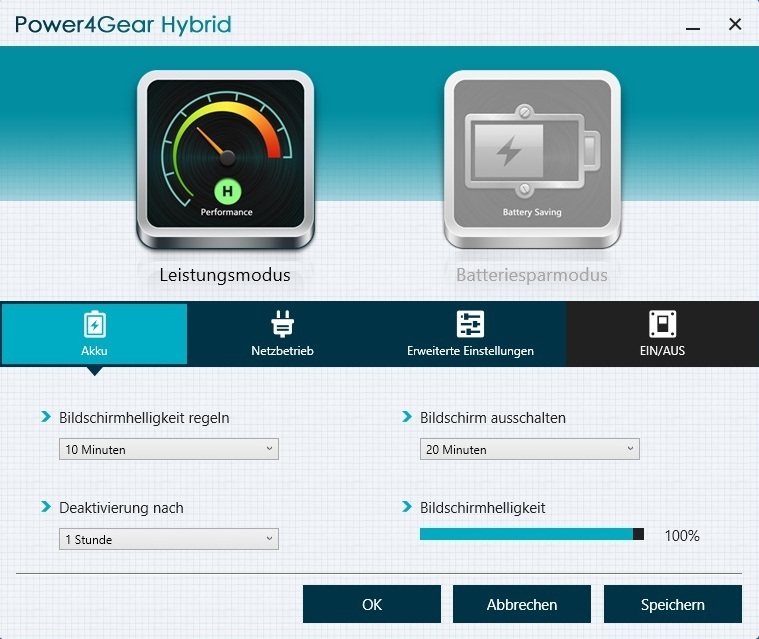 “Power4Gear Hybrid” handles the energy settings. 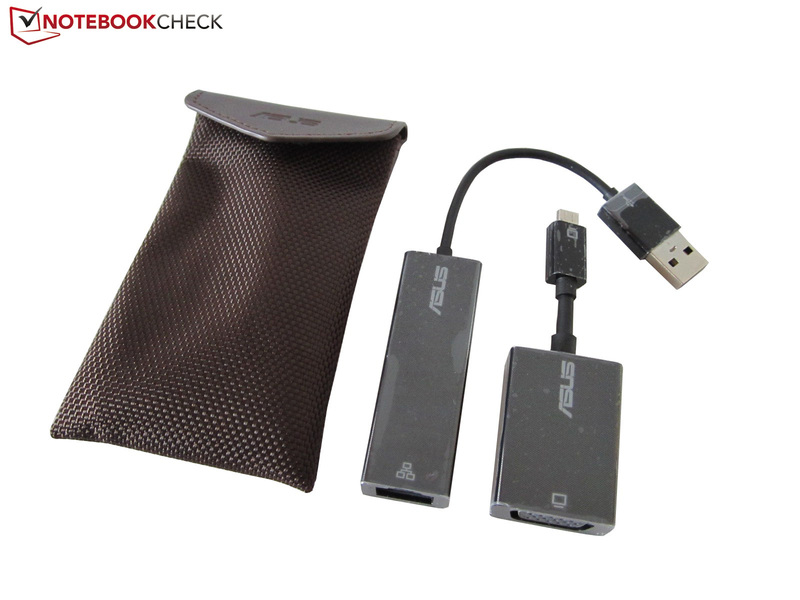 The “USB Charger Plus” supports the charging of external USB devices. The scope of delivery is pretty standard. Additional to the port adapters are; a warranty card, a manual and zip ties. Absolute highlight is the brown colored and pretty tight notebook bag. The leather cover is attached to the textured main body via Velcro. The black inside provides a good basic protection. Driver and Windows DVDs are not included. 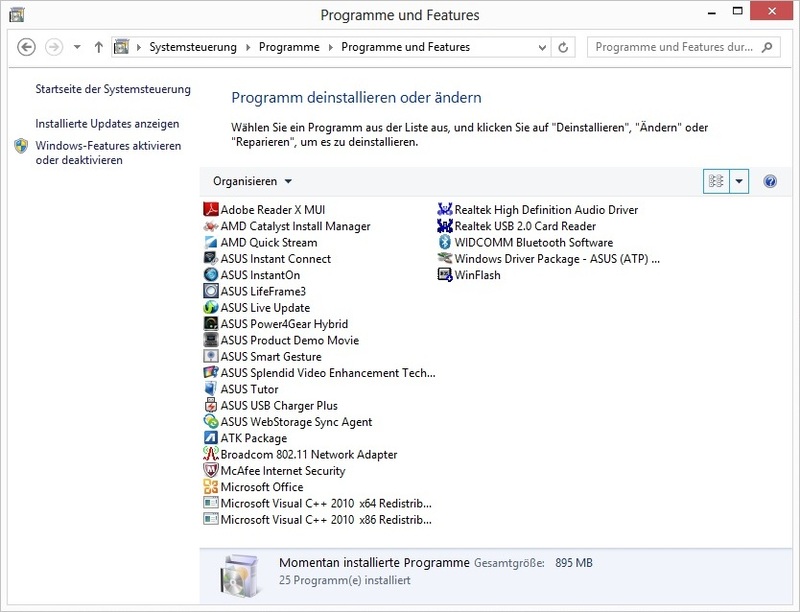 For the system recovery you can use the Windows function Restore (PC settings, general). 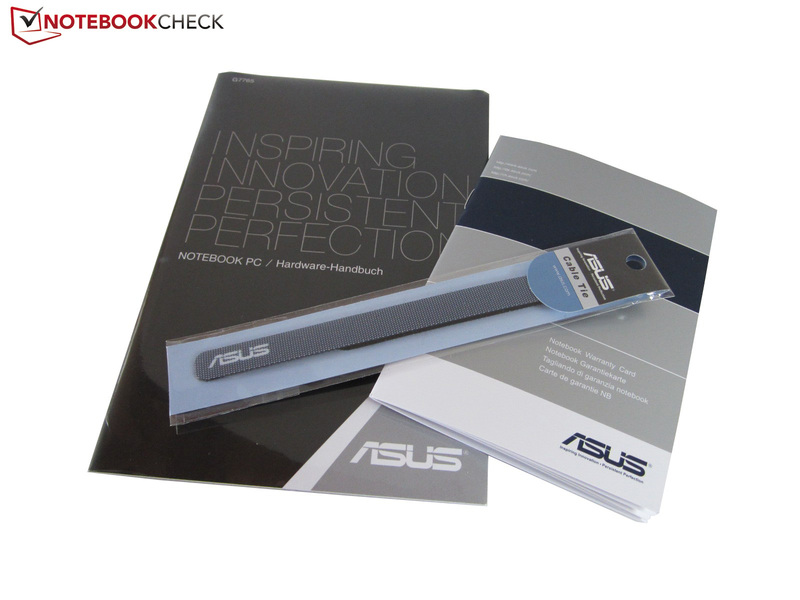 Asus offers a two-year warranty for the product (12 months international). 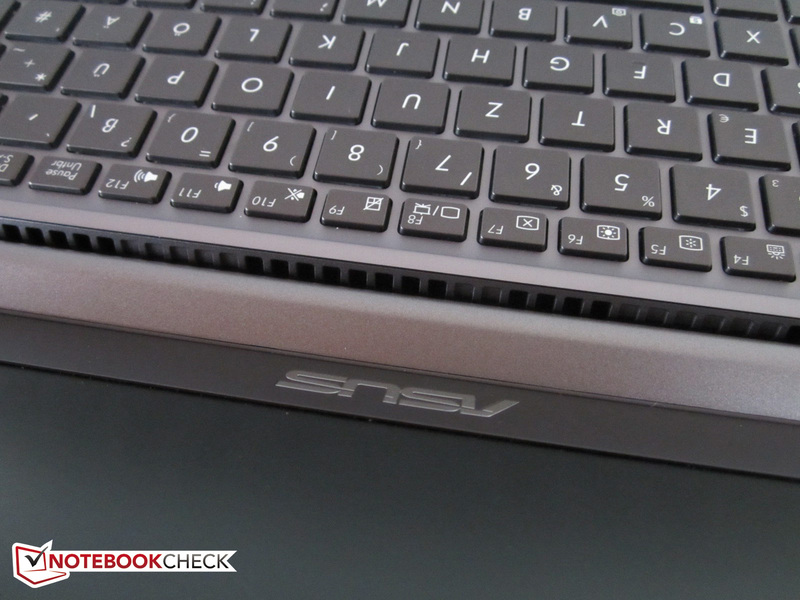 The dark gray chiclet keyboard leaves a good impression. Thanks to generous key lettering and the white illumination, which can be adjusted in multiple steps, the result is a very convenient input. Typical for Asus is the uneven illumination, but is has almost no negative impact for everyday use. The key size (mainly 16 x 14 millimeters/~0.63 x 0.55 inches) should also be convenient for most users. Be aware the arrow keys and the keys of the F-row are pretty small (only 8 millimeters/~0.31 inches high). The layout is okay, yet the combined Ins/Del key was distracting. There is not much to complain about with the keyboard feeling: pressure point and stroke are designed sufficiently. Nice details like the slightly rounded edges are other factors for the positive overall picture. With our experiences the keyboard is suitable for frequent writers. As usual, with Fn-combinations several comfort functions can be activated. Besides the brightness the volume can also be adjusted. A deactivation/activation of the wireless module, the display and the touchpad is also possible. 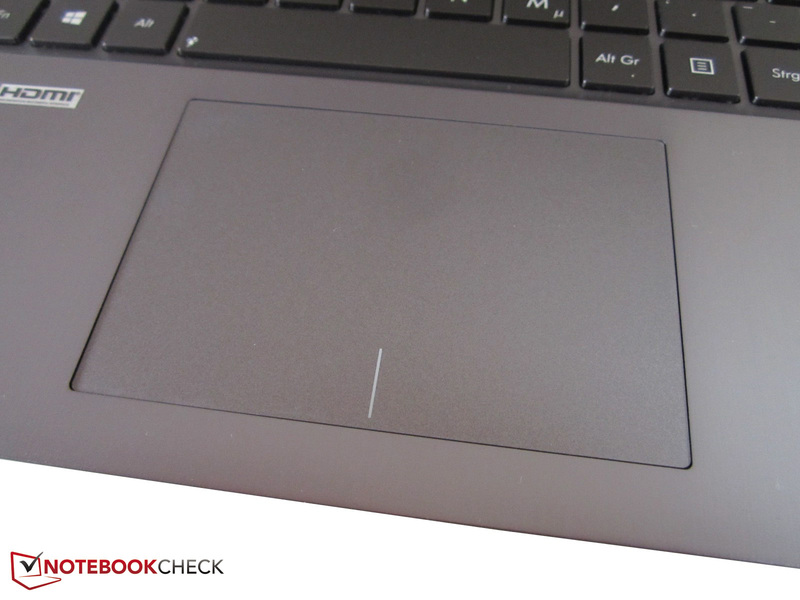 The minimally lowered touchpad is strikingly similar to the mouse replacement of the recently reviewed Lenovo IdeaPad Y500. Similarities do not only come with the dimensions (10.5 x 7.0 centimeters/~4.13 x 2.76 inches) but also with the buttons. 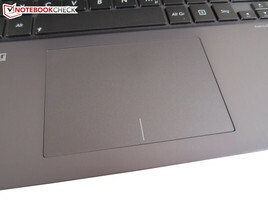 The latter are directly integrated into the smooth touchpad surface. The corresponding mechanisms are definitely a matter of taste. While one appreciates the seamless transition to the button area, the other criticizes the limited stability. 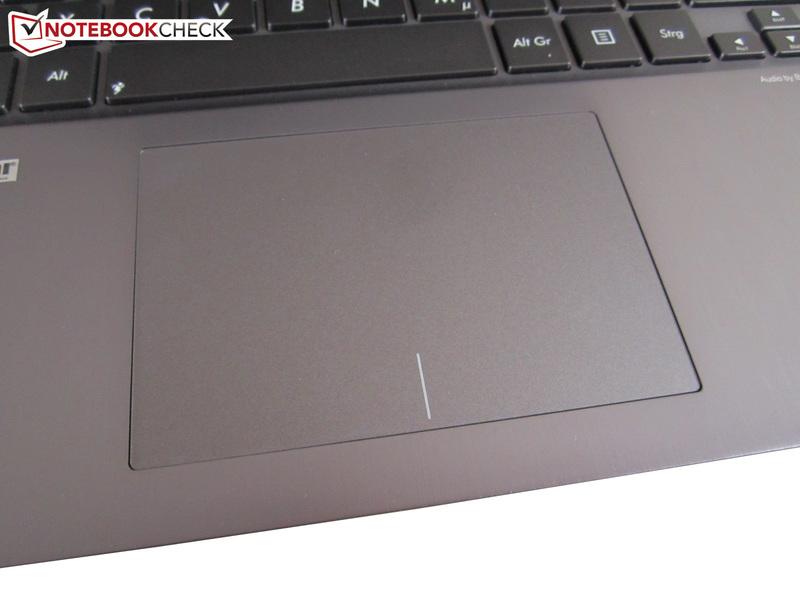 Compared to the Lenovo IdeaPad Y500 the touchpad cannot be pushed in so deeply but the stability is not quite perfect. 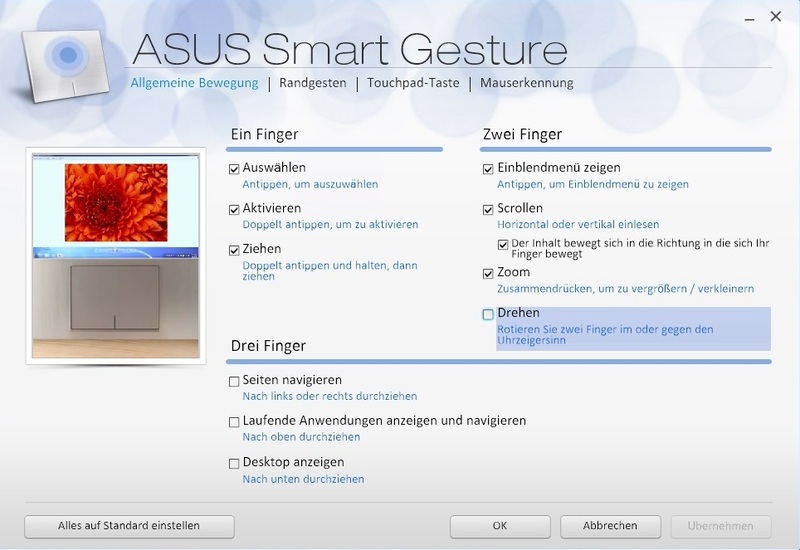 The convenient gestures that are presented clearly in the Smart Gesture software (see screenshot above) also have their flaws. The zoom function is especially unruly. 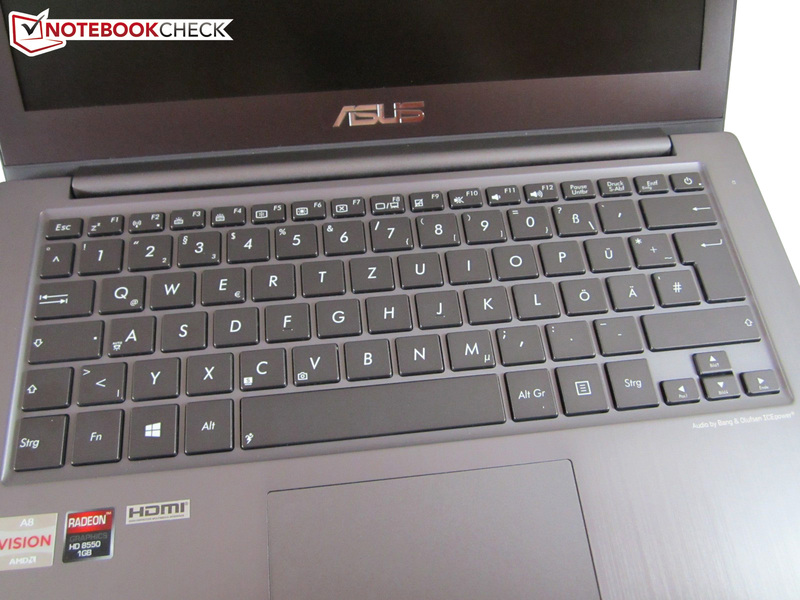 Although the precision is at a decent level, Asus could put some work into the accuracy of the touchpad. All in all it is still enough for the rating "Good". The specifications of the 13.3-inch display are pretty unspectacular. 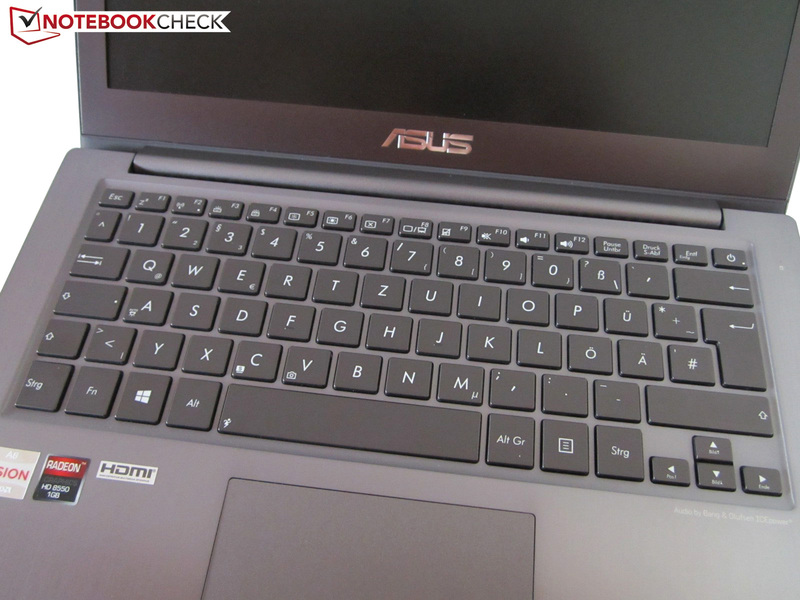 Asus uses a conventional TN panel that has the established 16:9 format and a matte surface. 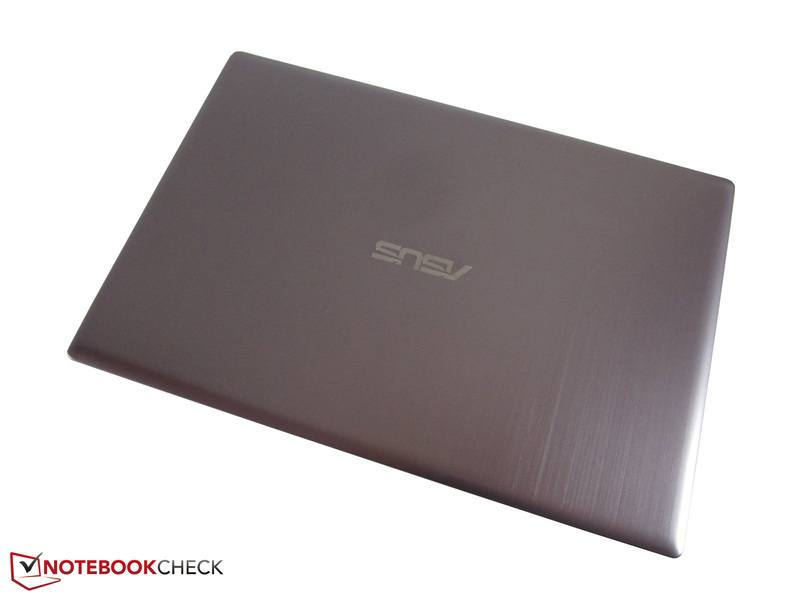 The term EWV that Asus uses on its global website indicates especially wide viewing angles. 1366x768 pixels seem to be very logical considered the selected components; however some users might have preferred a resolution of 1600x900 pixels. Unfortunately extensive multi-tasking is not possible with the standard HD resolution. Even with one open window the user has to scroll a lot (websites, text documents etc.). But enough theory, now we get to the measured values. The InfoVision M133NWN1-R1 panel could already prove itself in the Asus UX32A-R3001V. Our measurements show that the display is quite significantly superior to ordinary panels. An average brightness of about 240 cd/m² is by no means outstanding, but is easily enough for most tasks. Despite a small bleeding problem at the left and right display frame we were very satisfied with the brightness distribution (~ 90%). There is not much criticism with the black value as well. Almost 0.5 cd/m² ensure that black passages do not drift too much into the gray zone. This leads to a contrast of about 550:1. Less expensive notebooks often only reach values of 200 to 300:1. 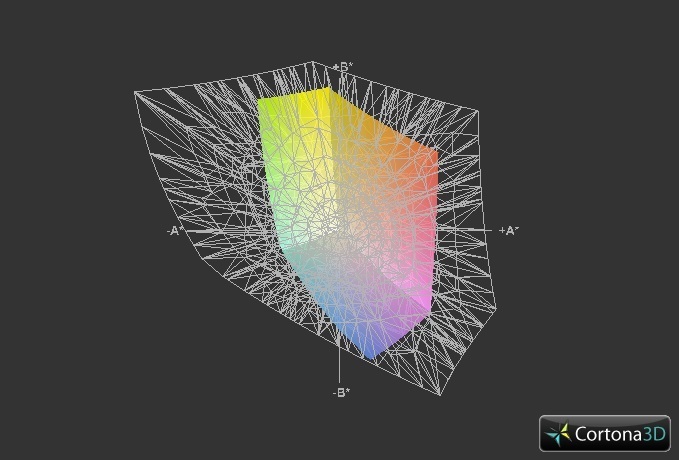 One minus point is the poor coverage of the color spectrum (no sRGB coverage). Pictures and videos appear with a slightly low saturation level. Thanks to the anti-glare display surface and the useful brightness the 13-inch device is well suited for outdoor use. The low reflection surface is easy on the eyes and facilitates the handling. For an ideal experience the luminance would have to be a little higher (280+). On bright days with indirect/direct sunlight the screen content is not always perfectly visible. Note: Our pictures were taken on a dreary winter afternoon. 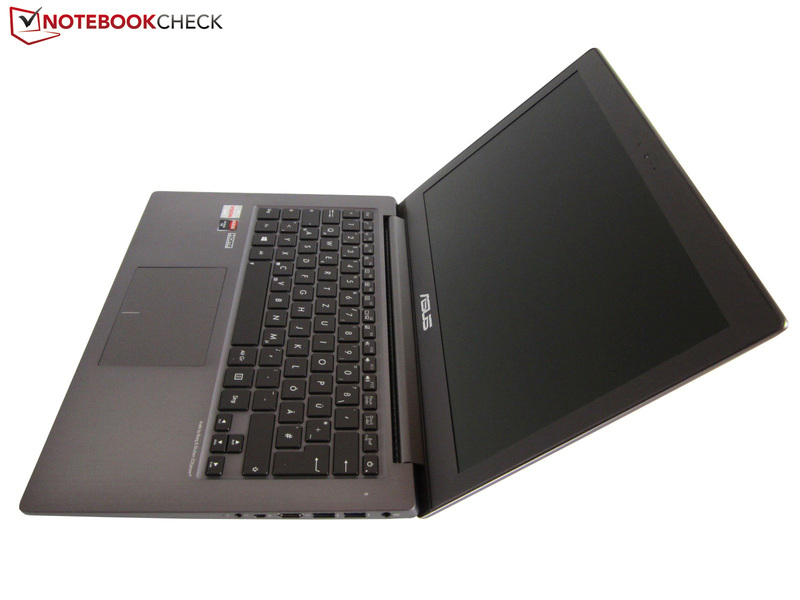 The VivoBook U38DT offers fairly good horizontal viewing angles. Even with wider angles the content remains natural. Apart from a considerable brightening the picture is still acceptable from above. If you tilt the display back the typical TN weakness appears: Games and movies are getting too dark, but the InfoVision M133NWN1-R1 easily wins against cheap standard panels. The 1.6 to 2.4 GHz clocked A8-4555M belongs to the family of power efficient ULV processors and is produced, like its Trinity siblings, in the outdated 32 nm process (Intel is long producing in the 22 nm process). With 19 Watts the Thermal Design Power is significantly reduced compared to the standard models. 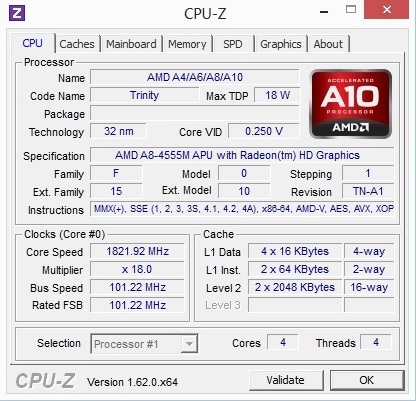 The similar clocked quad-core A8-3500M (1.5-2.4 GHz), for example, has almost twice the TPD with 35 Watts. The A8-3555M can only process one thread per core simultaneously because of the lack of Hyperthreading or similar parallelization technology. Four MB L2 cache seem pretty much compared to Intel products, however the Core-i generation also has a 3 to 8 MB large L3 cache. The immediate Intel competitors Core i5-2537M (1.4-2.3 GHz) and Core i5-2467M (1.6-2.3 GHz) cannot compete with 1.3 billion transistors. Both Sandy-Bridge representatives "only" have 624 million transistors. 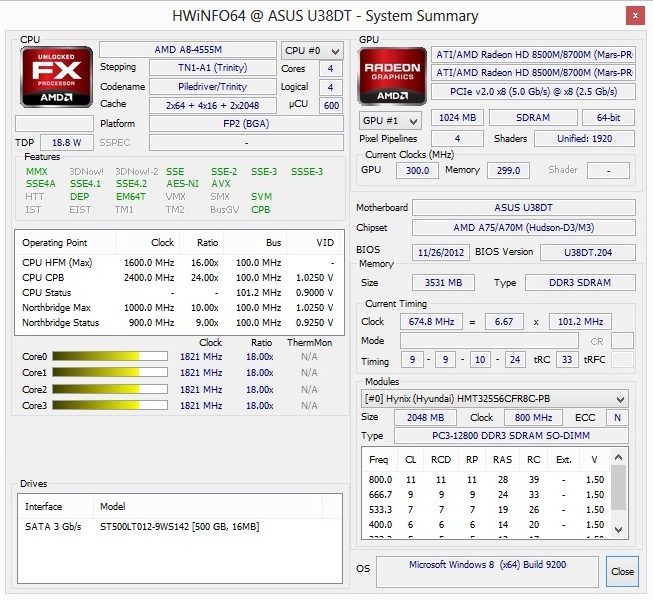 The DDR3 memory controller of the A8-4555M supports up to 1333 MHz. The manufacturer has a big problem with the processor. When more than one core is in use, the clock of the A8-4555M is temporarily reduced from the standard 1.6 GHz to a meager 900 MHz. Our measurements show that the throttling can have a massive impact on the performance. We checked the energy settings repeatedly (Windows control panel and AMD drivers) and the results with the second review unit were too low as well. We assume a general problem with the VivoBook U38DT. During use of a single-core the situation is more relaxed. 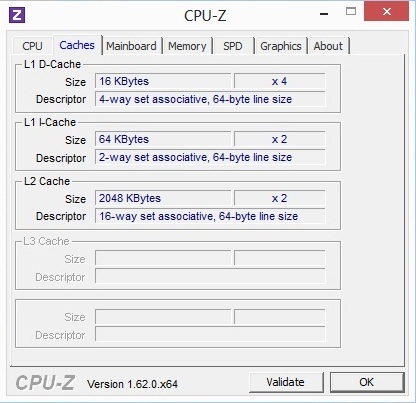 According to the tool CPU-Z the A8-4555M does not come close to the maximum available turbo clock, but at least it is 200 MHz more than the base clock with 1.8 GHz. 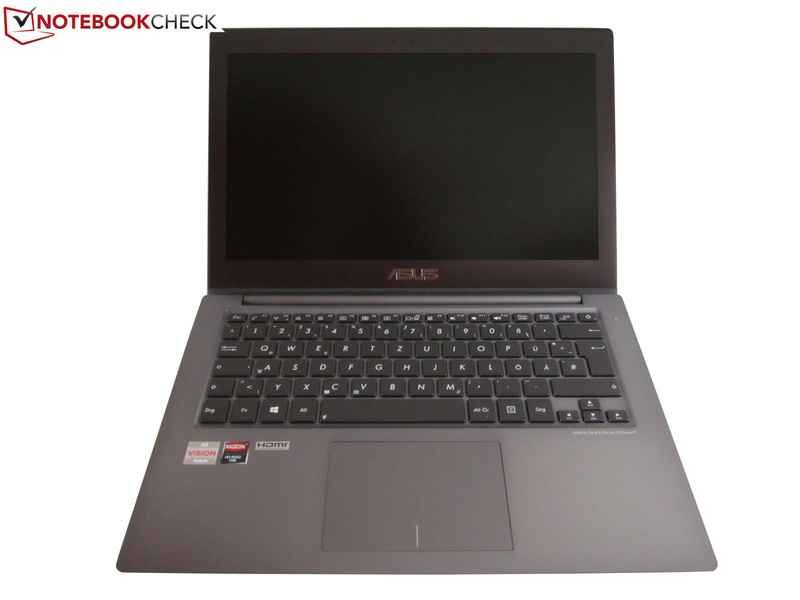 The low CPU performance is the weakest point of the subnotebook. 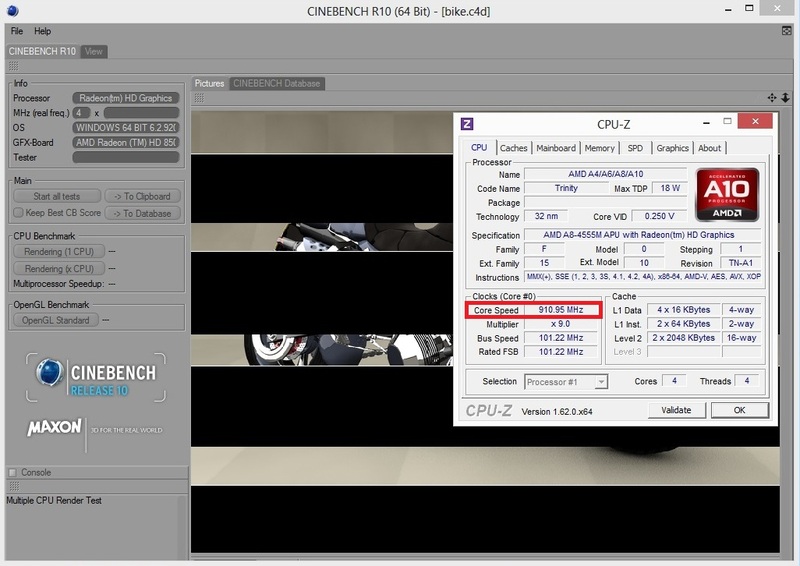 The Cinebench R11.5 score is very low with 0.42 points for the single-core rendering and 0.78 points for multi-core rendering. The already mentioned Core i5-2537M is more than 100% faster with 0.9 and 1.93 points (Samsung Series 5 530U4C-S02). 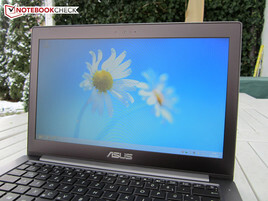 Even the slow 1.4 GHz Core i3-2367M with 0.53 and 1.32 points is superior (Asus UX32A-R3001V). If we have a look at the Lenovo IdeaPad S405 we can see that the A8-4555M without throttling and a higher turbo margin achieves 0.57 points (+36%) and 1.24 points (+59%). 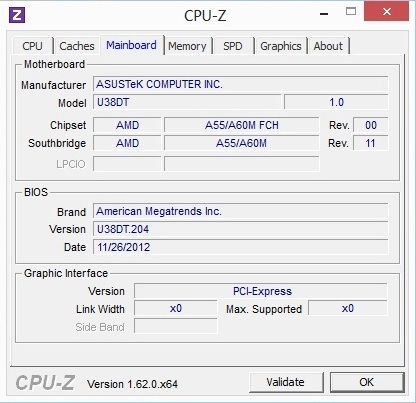 We can only hope Asus fixes the problem with the clocks as soon as possible. The VivoBook U38DT has two DirectX 11 graphics accelerators. The Radeon HD 7600G (Terascale-3 architecture) is integrated into the CPU and has a different clock than the bigger Radeon HD 7660G with only 320-424 instead of 497-686 MHz. 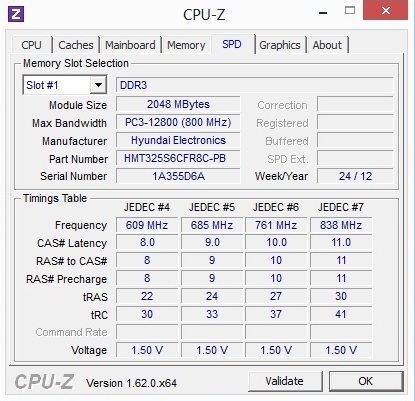 Because of the missing graphics memory the Radeon HD 7600G uses the system memory (according to the Catalyst Control Center 512 MB clocked at 667 MHz). 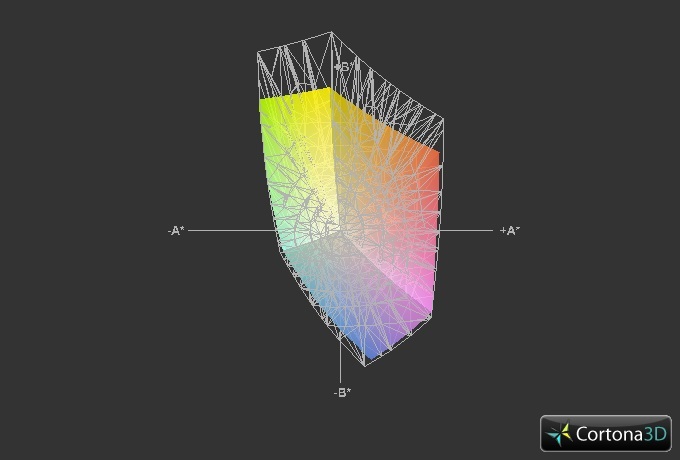 384 unified shaders correspond with the dedicated graphics. With the Radeon HD 8550M AMD finally introduces its new GCN architecture (Graphics Core Next) to the highly competitive low and mainstream market. Thanks to the modern 28 nm process the latest generation is especially energy efficient. Suboptimal: The video memory has 1024 MB DDR3 memory and a clock of 900 MHz but is just connected with a 64-bit interface. 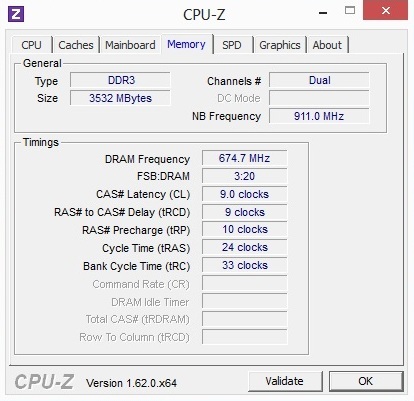 According to the tool GPU-Z the core clock is 700 MHz. Luckily Asus decided not to use the Dual-Graphics technology (some sort of CrossFire for different GPUs). The manufacturer only uses a dynamic graphics switching. Although Enduro still cannot compete with Nvidia's Optimus-counterpart (worse detection rate, less visual aids etc. ), the technology made a noticeable improvement over the last months. In the appropriate driver menu (right screenshot) the user can easily assign the desired graphics to individual applications. “Maximum Power” represents the HD 8550M, “Energy Saving” stands for the HD 7600G. You can also change the global settings. 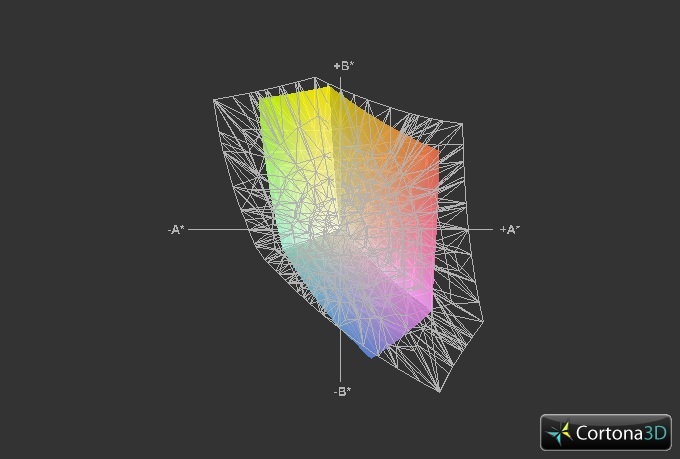 When you choose the setting “Maximize Performance”, all the 3D applications start with the dedicated graphics card. That way an incorrect allocation of the GPU can be avoided. The performance of the AMD graphics very much depends on the requirements of the application being used. 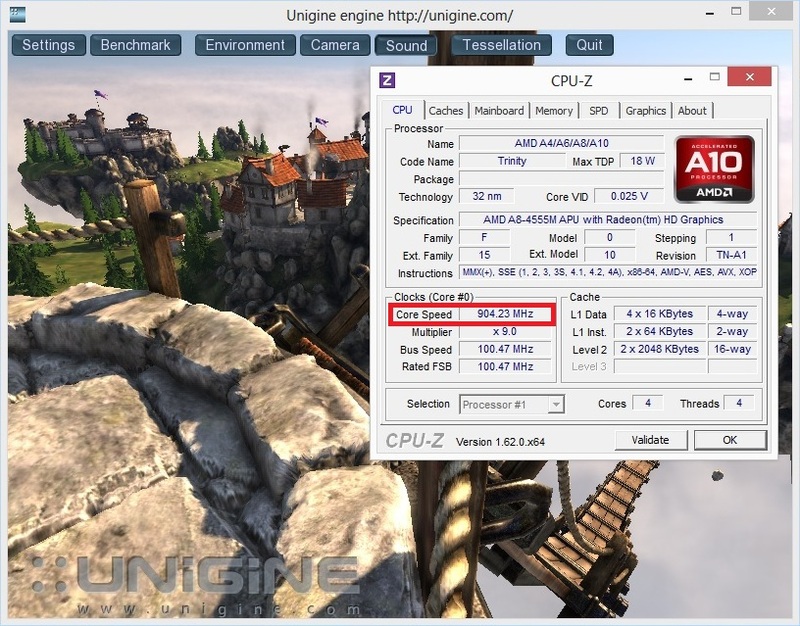 The higher the CPU influence, the higher is the limiting factor of the throttling A8-4555M. 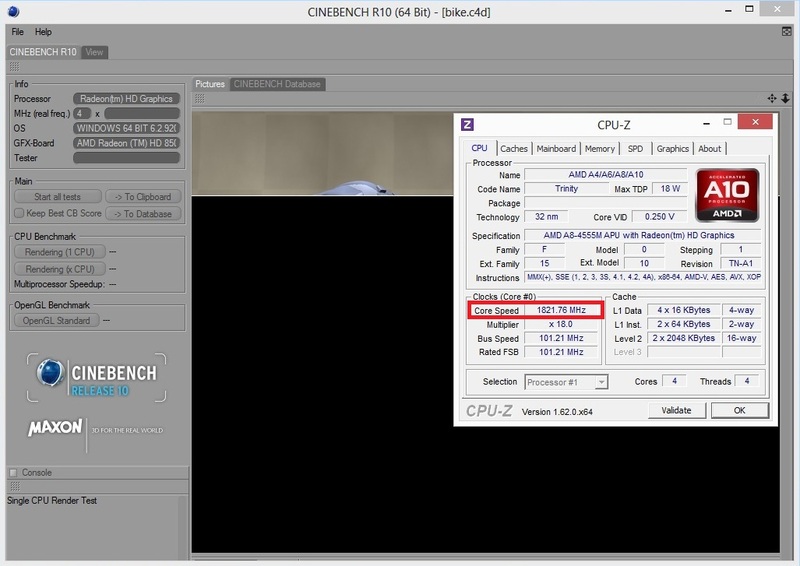 The subnotebook handles the 3DMark 11 (1280x720, “Performance Preset”) quite well. With a GPU score of 1,307 points the Radeon HD 8550M is on the same level as the GeForce GT 640M LE (1,259 points @ Fujitsu LifeBook AH532) or Radeon HD 7690M XT (1,346 points @ HP Pavilion dv7-6c07eg). 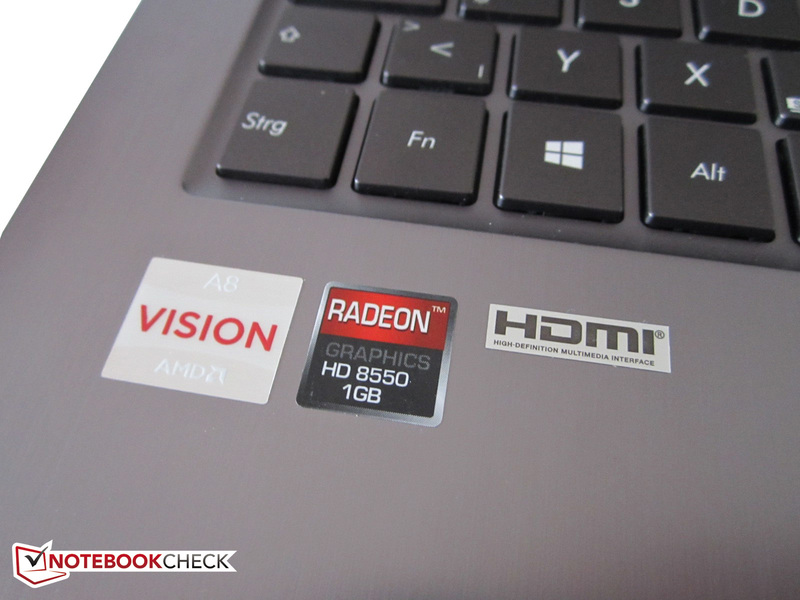 For comparison: The Radeon HD 7600G only manages half of that (628 points @ Lenovo IdeaPad S405). The result of the Unigine-Heaven-2.1 benchmark (1280 x 1024, High, Tessellation normal) is not very overwhelming. With 14.1 fps it can compete with the GeForce GT 630M at most (14.3 fps @ Medion Akoya P6633). 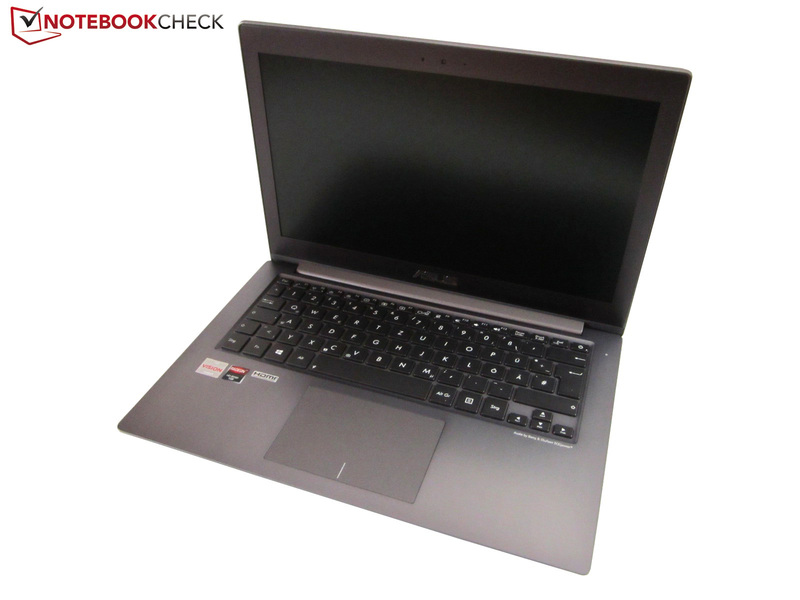 Asus integrates a 500 GB hard drive into the subnotebook. The ST500LT012-9WS142 is provided by Seagate and runs at 5,400 rpm. 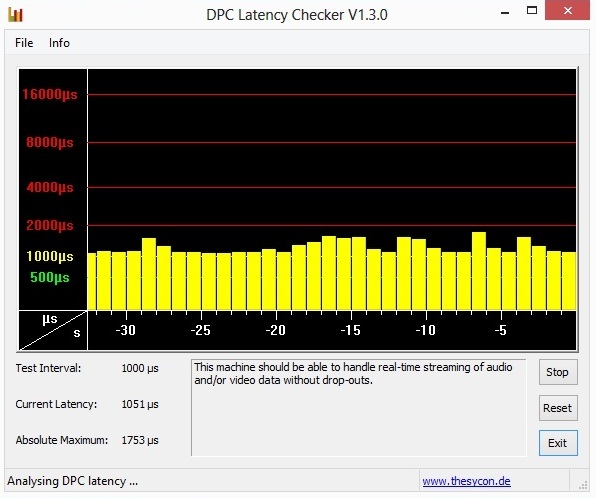 HD Tune shows a decent performance. 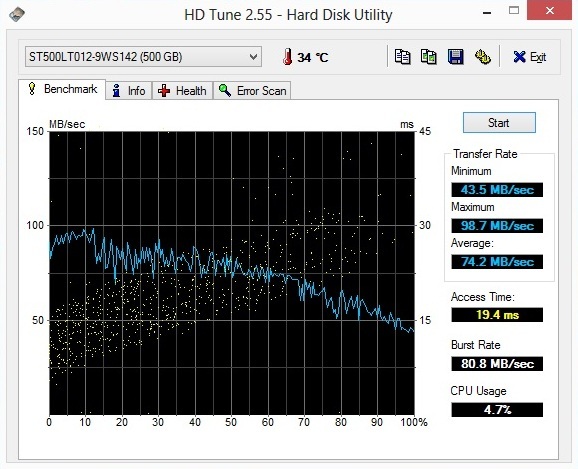 The average transfer rate of 74 MB/sec and an access time of 19 ms are neither below nor above average. The CrystalDiskMark results are slightly higher. Not every 5,400 rpm model reaches 91 MB/sec for sequential reading and 85 MB/sec for sequential writing. As far as our experience goes the everyday Windows use is a bit disappointing. Especially during multi-tasking the hard drive is the limiting factor. For example; copying data, downloading updates and installing applications at the same time, result in a very slow response time. 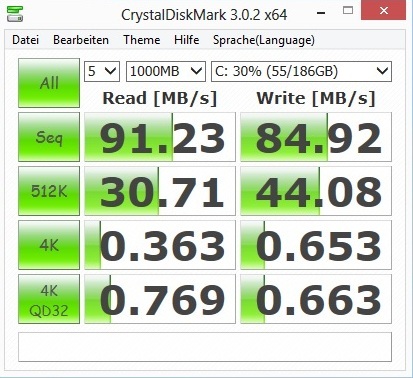 Compared to a 7,200 rpm model or a fast SSD the hard drive does not stand a chance. 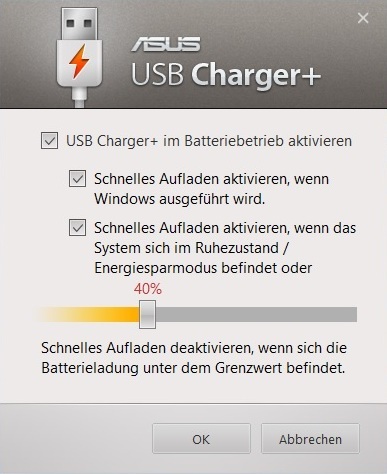 In other words: The VivoBook U38DT is not ideal for a power user. The performance for the average user however is acceptable. Because of the second-class hard drive and the pretty slow CPU the performance of the overall system is in the bottom third. 1,714 points for the PCMark 7 won’t impress anybody. With this result the 13-inch device can only compete against notebooks with a cheap Intel B-series processor (Pentium B950 to B980). Among others we have the Lenovo IdeaPad G580-MBBG3GE (1,670 points), the HP Compaq Presario CQ58-148SG (1,700 points), the HP Pavilion g6-2200sg (1,723 points) or the Lenovo IdeaPad N581-MBA4YGE (1,742 points). 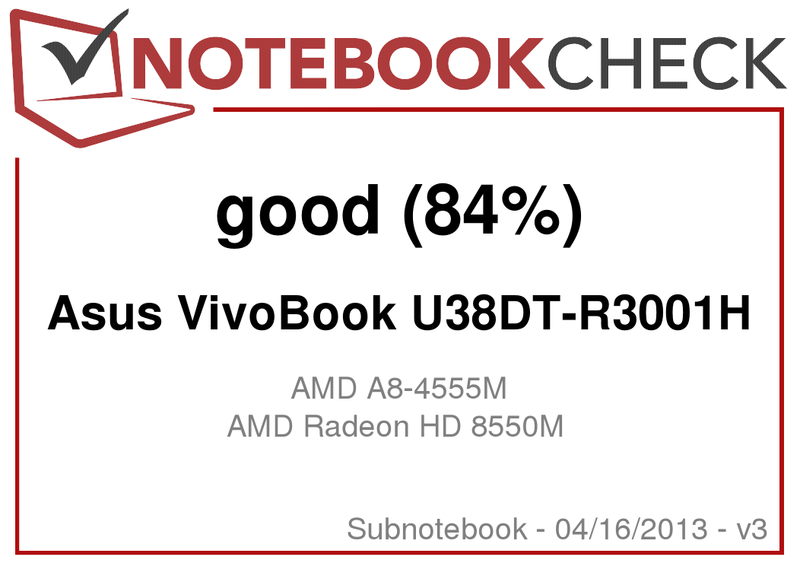 Gamers should avoid the VivoBook U38DT. The low clock of the A8-4555M pulls the performance down to a level that only modest and/or older games can be played with more than 25 fps. From the 25 tested titles only 10 were fairly playable. Most of the time the user has to live with minimum details and a slightly reduced resolution. And even if the frame rate suggests a smooth experience on paper, during gaming there are constantly annoying frame drops due to reloading - whatever settings you select. Even the integrated Intel HD 4000 processor graphics performs better sometimes. Without the CPU throttling the performance should be much better. 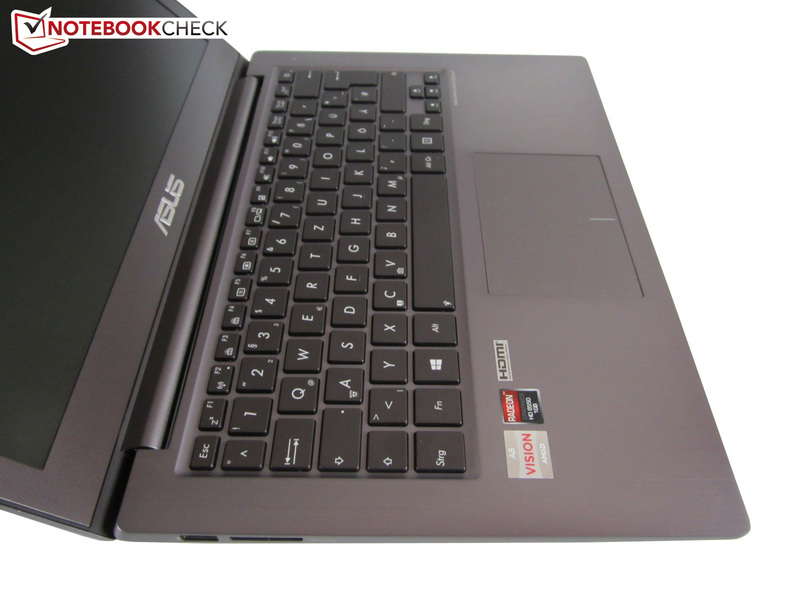 While idling the noise level is similar to the Asus UX32A-R3001V (Core i3-2637M & HD Graphics 3000) we reviewed a few months ago. Just under 31 dB (A) is quite low, although the 13-inch device is never completely silent. Even with little load the user hears a slight noise and a subtle clatter of the hard drive. Simple tasks like MS Office, video or web browsing are also not disturbed by a distracting noise level. With CPU-intensive tasks (3D applications etc.) the sound intensity rises to a proper but not annoying level. From a distance of 15 centimeters (~6 inches) we measured an average 38 dB (A) for the 3DMark 06. Although the fan noise is pretty high-pitched (and makes the notebook subjectively louder than the values would suggest) it can be tolerated pretty well. More than 41 dB (A) were not possible even in our stress test. The identically priced UX32A (800 Euros/~$1092) has no dedicated graphics and is quieter under load (36-38 dB (A)). The temperature development was good without exceptions. During idle the whole chassis remained pleasantly cool: Just under 27 °C (80.6 °F) provides convenient long-term use. At higher loads the rear area of the notebook gets noticeably warmer. A maximum of 43 °C (109.4 °F at the top) or 38 °C (100.4 °F at the bottom) are non-problematic. The palm rest reaches a maximum value of 31 °C (87.8 °F) - a moderate result. Overheating of the hardware is no problem. 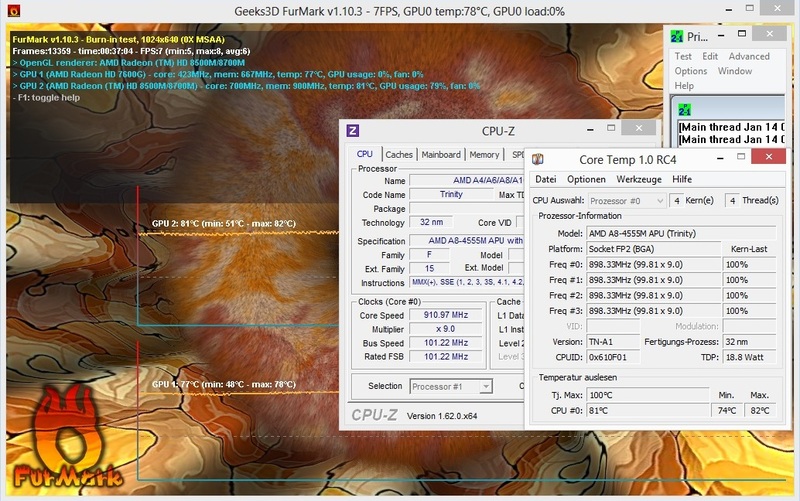 After one hour maximum load (FurMark + Prime95) the graphics and the processor remain at around 80 °C (176 °F). (±) The average temperature for the upper side under maximal load is 37.2 °C / 99 F, compared to the average of 30.7 °C / 87 F for the devices in the class Subnotebook. (±) The maximum temperature on the upper side is 43.3 °C / 110 F, compared to the average of 35.8 °C / 96 F, ranging from 22 to 57 °C for the class Subnotebook. According to the manufacturer the sound system was developed in cooperation with the Danish company Bang & Olufsen (ICEpower). Asus speaks about "advanced sound processing to render amazing sonic output, which provides you with the immersive sound quality". Okay, that kind of marketing talk is of course completely exaggerated, but considering the small dimensions of the two speakers, which are integrated into the bottom, they tend to please. Even some bigger competitors have a hard time in direct comparison. Games, movies and music sound pretty balanced. That the sound seems to be a bit slushy and muffled is not unusual for notebooks. Despite the above average performance, headphones or external speakers should be used if possible. For occasional use the speakers are acceptable. 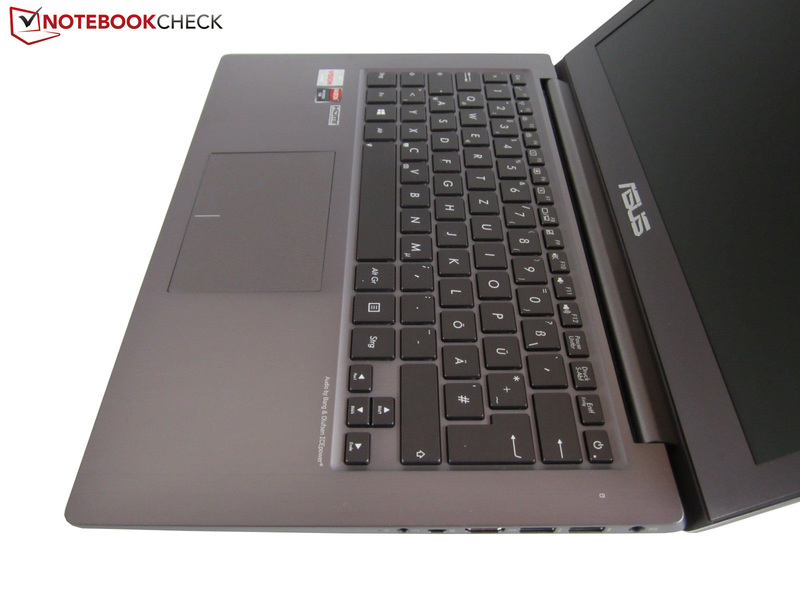 The switchable graphics make sure the 13-inch device wastes no unnecessary power. With 10 to 17 Watts the consumption during idle is slightly above the Asus UX32VD with a 1.7 GHz Core i5-3317U and a GeForce GT 620M (6-13 Watts). 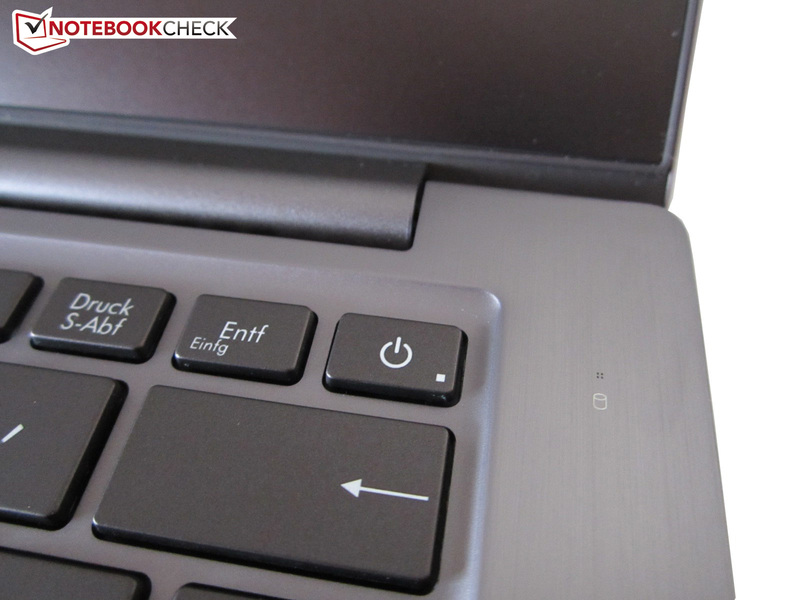 Under load the VivoBook U38DT is more frugal (42-52 Watts against 45-61 Watts). The non-removable battery has a capacity of only 48 Wh and the runtimes are very limited. Under load and with maximum brightness the battery keeps the device running for 1.5 hours, with wireless Internet browsing and medium brightness just under 4 hours are possible. The result of the idle test is not listed because of some strange values (Battery Eater seems to be always assigned to the Radeon HD 8550M). A DVD test was not performed due to the lack of an optical drive. If you overlook the limited port equipment and the annoying throttling (multi-tasking reduces the CPU clock to 900 MHz), Asus made almost everything right with the U38DT-R3001H. 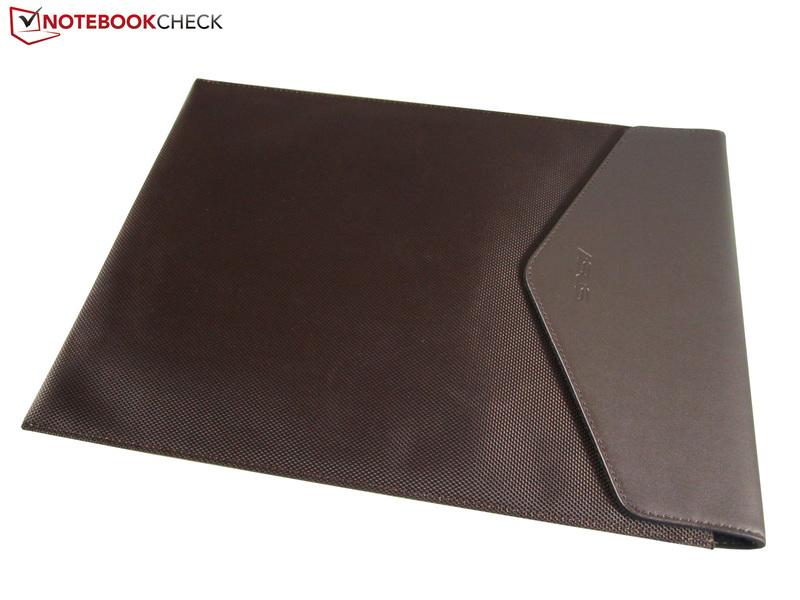 The main attraction is the very stylish and very lightweight metal case (only 1.55 kg/~3.42 pounds). Such a high build quality usually cannot be found in devices less than 1000 Euros (~$1365). Apart from some small details the input devices are also very good. The manufacturer shows no weakness with the display either. The matte HD panel offers decent to good values. 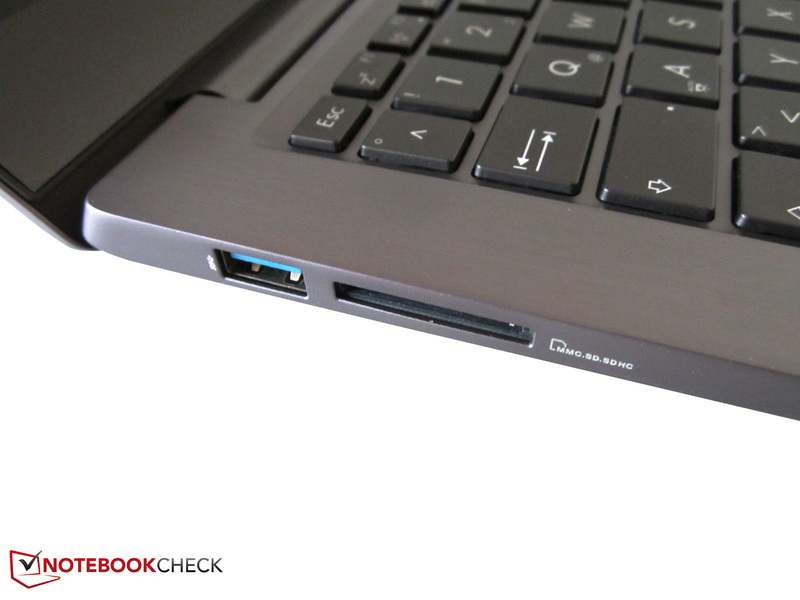 Considering the low notebook height (less than two centimeters/~0.79 inches) we find the performance reasonable. Further positive aspects are the moderate temperature and noise levels. Even under heavy load the 13-inch device does not get excessively loud or warm. The included notebook bag helps to overlook the missing driver and recovery DVDs. The battery runtime could have been better for our taste. Runtimes over 4 hours are only possible with little load and reduced brightness. All in all we can still give a clear buy recommendation for the U38DT-R3001H. Price conscious users who want a small device with high mobility are at the right place. The price is around 800 Euros. The chiclet keyboard gets a high rating. 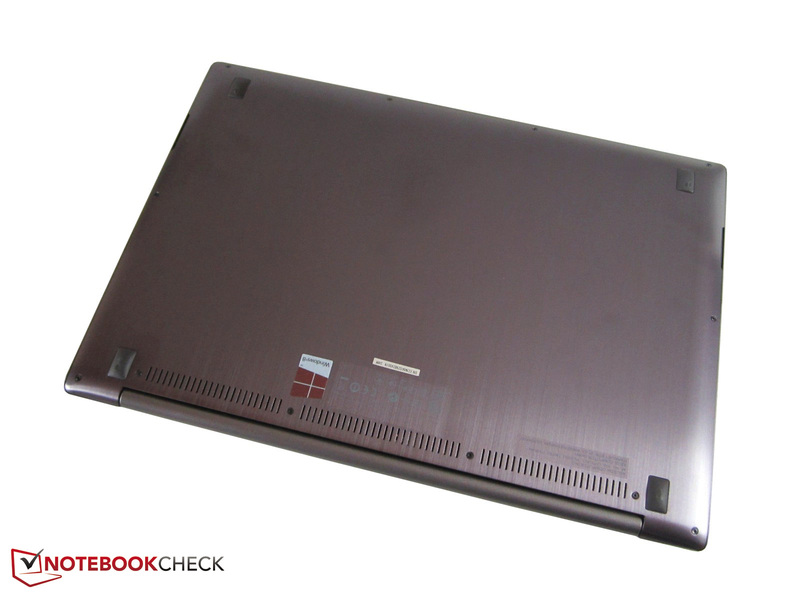 The VivoBook U38DT is primarily powered by AMD hardware. Matter of taste: The power button was integrated into the keyboard. The tiny arrow keys are not designed for gamers. 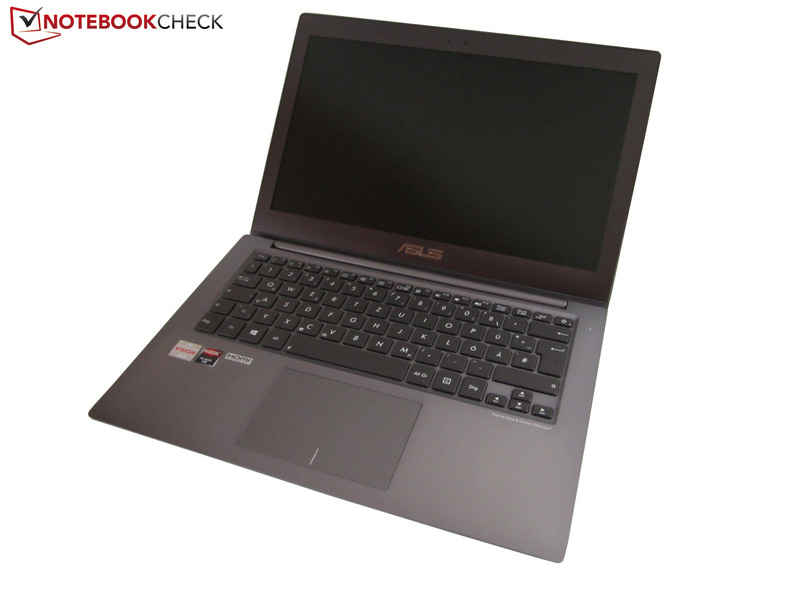 Asus scores with excellent build quality. The fan openings are underneath the hinge. The smooth touchpad is generously sized. A Kensington lock is not on board. A total of 3 USB 3.0 ports are available. The notebook comes in a compact box. Asus includes a brown colored bag. Additionally the buyer gets a warranty card a manual and zip ties. VGA and RJ-45 Gigabit-Lan are only available via adaptor. Due to the limited available space a numblock is missing. Asus integrated an ambient light sensor. 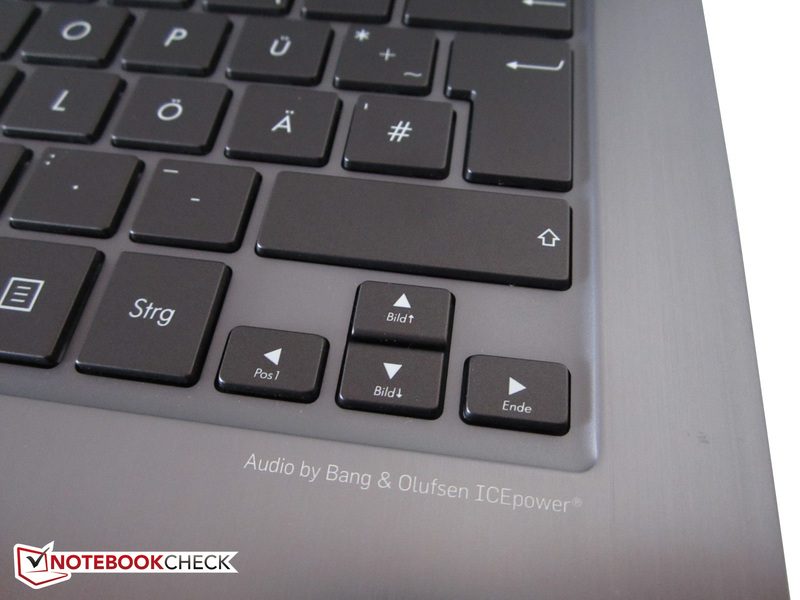 The VivoBook U38DT is made of aluminum. Thanks to high-class materials the 13-inch device is very robust. 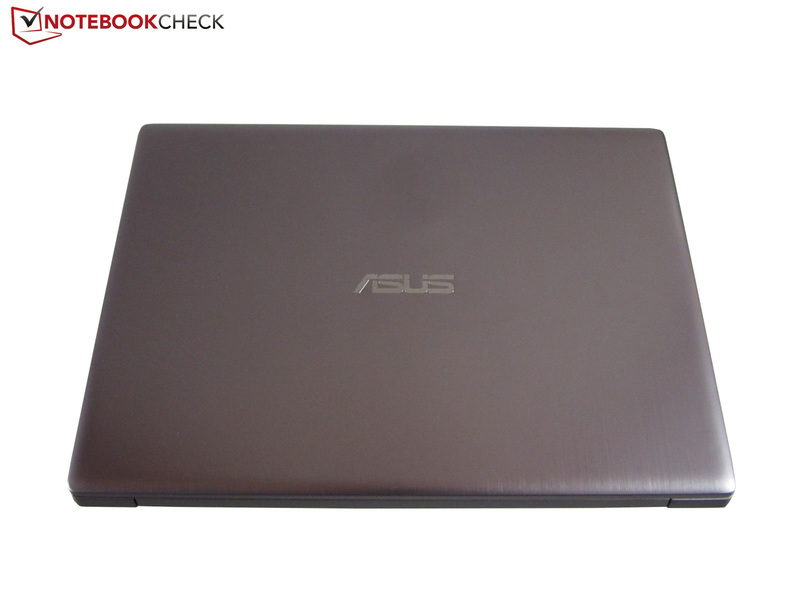 Asus uses a silver gray color for the most part. The bottom can be completely unscrewed. The maximum opening angle is 130°. The matte surfaces are very durable. The non-glare panel allows use outdoors. 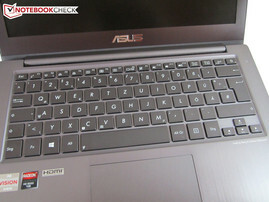 Asus did a great job with the design. The keyboard has a multi-level illumination. The allrounder weighs only 1.55 kg. The base unit is just 1.5 cm in height. The port equipment is mid-level. The 13-inch device even looks good from underneath. Unusual: The power supply unit is directly connected to the socket. Especially the lightweight and thin construction. A CPU-throttling should not occur under normal circumstances. Designing a higher-quality and nobler case is hardly possible. 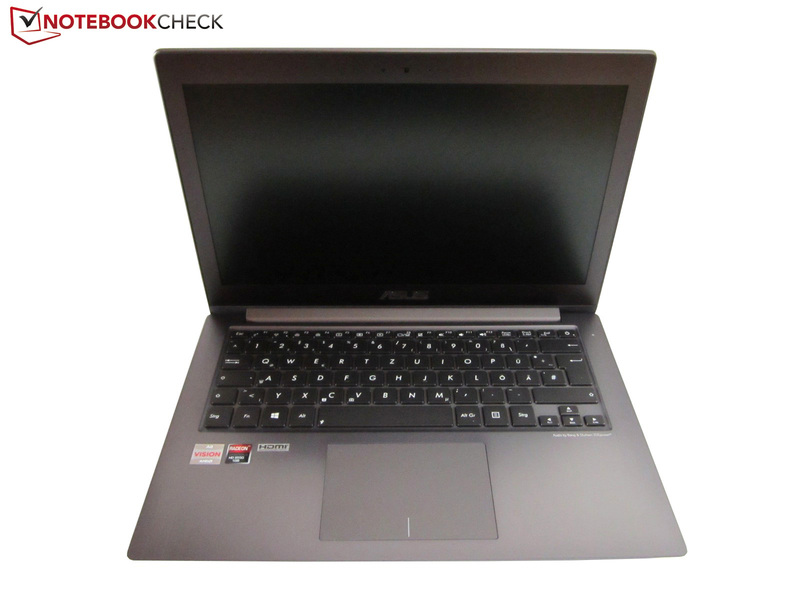 13-inch subnotebooks and ultrabooks that are less than 1000 Euros. 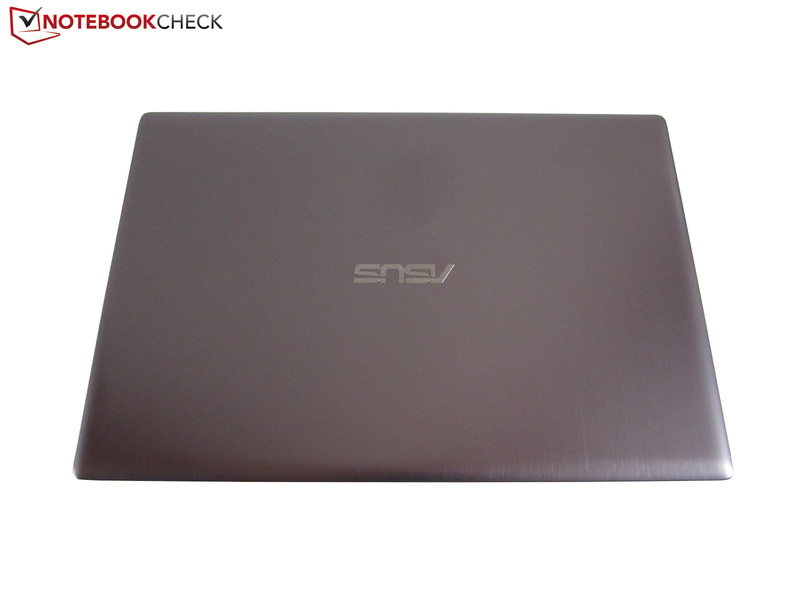 For example the Asus UX32A, the Acer Aspire S3, the HP Folio 13, the Fujitsu LifeBook UH572 or the Lenovo IdeaPad U310.